Big Schedules is the sailing schedule search engine that delivers live schedules and powerful results for you. 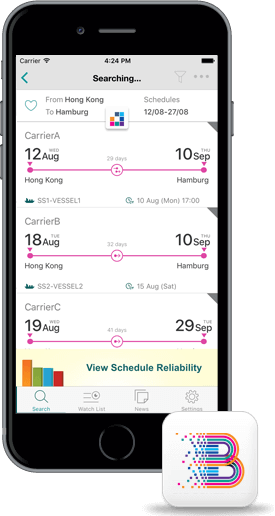 You can now access the up-to-date, multiple-carrier schedules on the go. Event Monitoring – Stay informed of vessel and port incidents that may impact the sailing schedules you search. Schedule Comparison – Select routes by comparing up to three schedules along with their arrival accuracy. Vessel Tracking – Track the current position and past routes of over 12,000 container vessels on an interactive map. See potential vessel arrival delay alerts in the tracking details to improve planning. Watch List – Subscribe to receive alerts about sailing schedule changes and vessel status updates to respond faster to potential supply chain disruptions. Carrier Performance Analytics – Gain market intelligence on carrier performance and customize analysis options to better fit your business needs. It's time to elevate your shipment planning with the next revolution in big data management. Download the Big Schedules mobile app to start your search today!